With all my finals almost done and a few short days of absolute freedom before I had to go back to the US, I took full advantage of my free status and ventured to the farthest reaches of Hong Kong and beyond on my own. On Monday, I went to this mall that was about an hour away by MTR called, “Elements.” It was called that because it was segmented up into the five different elements: Earth, Wind, Fire, Water and Metal. Now this was one swanky mall I was in. How did I know? 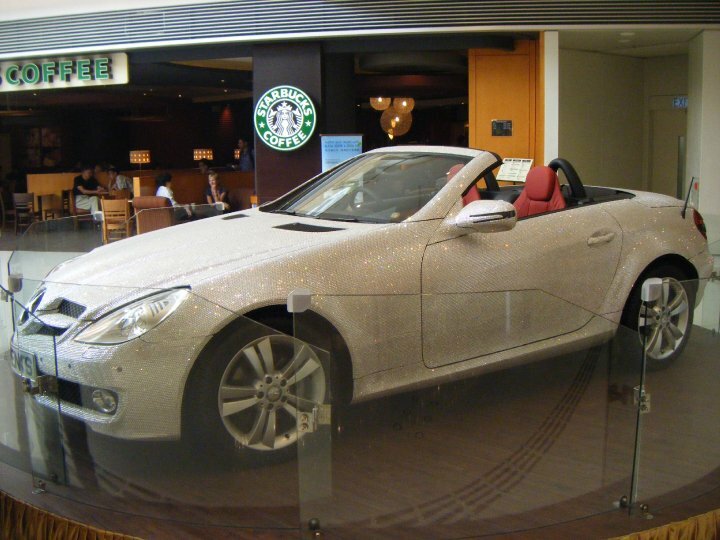 The first thing I saw upon entering from the MTR station (conveniently attached) was a convertible Mercedes-Benz with red leather interior that was entirely JEWEL ENCRUSTED! I kid you not – the whole thing sparkled and dazzled from every angle. It shone bright like a million diamonds. Don’t worry – I definitely got pictures of that beauty! Then, I proceeded through the mall and saw every top designer known to mankind: Prada, Gucci, Valentino, Escada, Karen Millen, DKNY, Armani, etc. – you name it, Elements had it. And to top it all off, Elements had a store called “Cosi” which was designed specifically for weary shoppers to take a power nap in one of the many egg-shaped pods before continuing the shopping spree. Genius! This mall thought of everything. 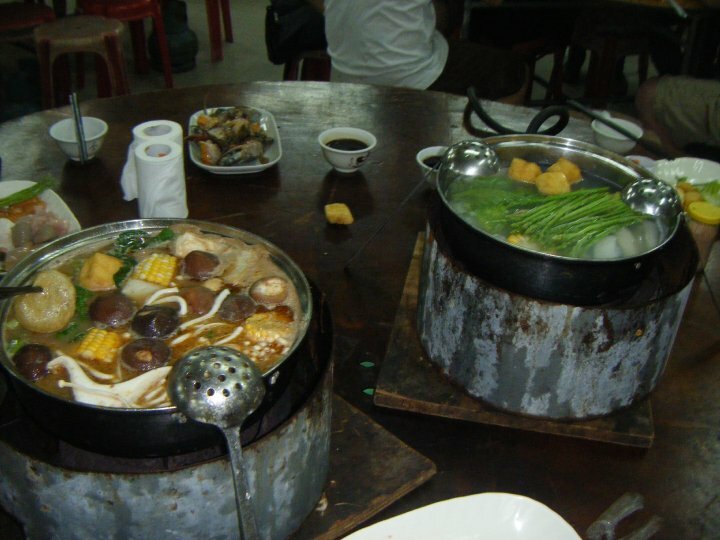 For dinner that night, a group of nine of us went to have hot pot (kind of like the one I did with my buddies around Chinese New Year) on the brown MTR line. It was very similar to the one I did before, only more rustic. This place was an open air restaurant with propane fueled burners on the table that the staff would bring the pots of meat or vegetable stock to sit on top of them. All the food (seafood, veggies, meats, etc.) was laid out buffet-style on these long tables where you could select whatever you wanted and take it back to your pot to cook. We had a great time – two bots of boiling water, more and more food because everyone would go up and just collect more for the group as a whole, great weather to do it all in – it wasn’t fancy, but it tasted pretty good and was a very fun, social meal. Our rustic hot pots. Looking tasty already. The following day I joined Erin, Mark, Mina, Jessica and Henry for dim sum at the campus restaurant in the early afternoon. Dim sum is most definitely one of the things I miss most about Hong Kong – it was so good and there were so many varieties of dim sum to choose from! Some of my favorites were the barbecued pork buns, the shrimp dumplings with crab roe, the Xiao long bao, the bok Choy with oyster sauce, and the custard buns – and those are just some of them. After lunch I set out to explore more of the city. My destination that day was Central. I had the idea that I was going to browse the antique road in Central called “Cat’s Street” and try to find the Jade Market, too. That didn’t happen at all. I just ended up wandering all over Central and Soho, riding the Mid-Level Escalators, and having a fine time exploring streets and restaurants (so many really nice restaurants I had no idea existed) and shops I’d never seen before. I’m pretty sure I passed through the heart of the art-gallery district, part of the antique district, and at least a couple of really hot restaurant streets – I even saw a number of the restaurants my brother’s friend Clayton owned – Caramba, McSorley’s Alehouse, Cafe Siam, and Boca (and of course photographed all of them). That turned into an excellent way to spend my afternoon. 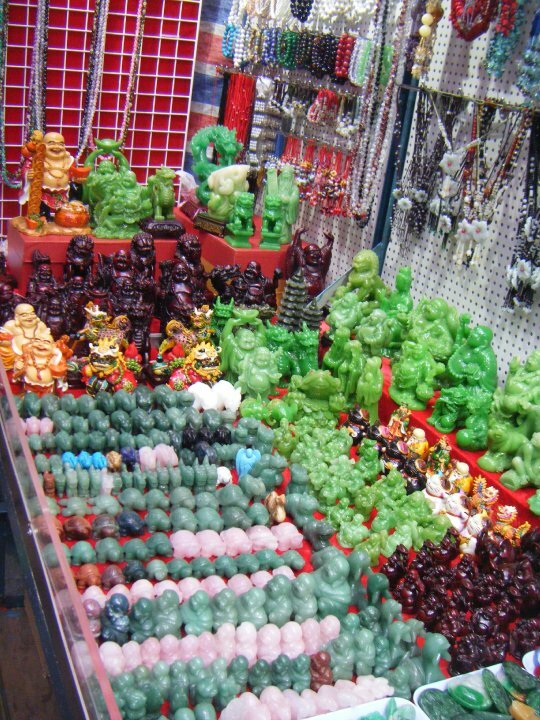 This wasn’t on Jade Street per se – just a regular jade stall in Mong Kok market. Still pretty cool though. Finally, that night I had a dinner date with a man I’d met in LKF just that past Thursday. He was originally from Pakistan, but studied in England and Singapore, and had dual citizenship there in Hong Kong where he’d lived for the past 11 years. Turned out he worked for an American company and was the Head of Operations for the Asia region, and he dealt mostly with the printing industry. For this dinner, he really pulled out all the stops, so to speak. We went to the most Western restaurant I’d been to since coming to Asia: Dan Ryan’s Chicago Bar and Grill, and along with the Caesar salad we shared, I had a 12 oz USDA strip loin steak for dinner (he recommended it)! It may not seem like a big deal, but for me (and where I was geographically it definitely was). For a minute, as I looked around the restaurant and ate the best (US) beef I’d had in a long time, I felt like I was in America. It was that familiar – as long as you tuned out the Chinese waiters and busboys – you would have sworn you were in an upscale steakhouse back home. Seriously. I had a really good time, and we ended up talking until the restaurant closed at midnight. Fan boys of the race horses? 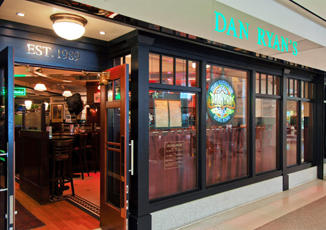 Dan Ryan’s Chicago Bar and Grill… in Hong Kong. I hope you’re all still enjoying my updates as much as I’m enjoying reliving the past. There will be at least a few more blogs before this saga wrapped up and I boarded that big plane bound for San Francisco. Don’t miss them. Until then, cheers! 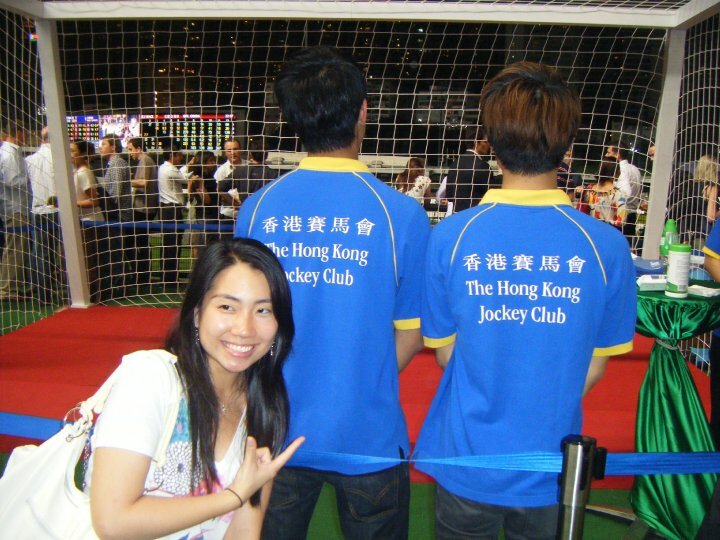 This entry was posted in Asia, Hong Kong and tagged Asia, Dim Sum, Finals, Hong Kong, Hot Pot, Jewel, LKF, Mercedes, Shopping, Travels on May 14, 2014 by Paige N..